Two noteworthy events in the world of basketball cast some light on the state of US-China relations in the summer of 2011. On 20 July, at a elegant and moving ceremony in his native Shanghai, Yao Ming officially retired from the NBA, closing what sports commentators in both nations agree is an important chapter in the history of the league and the game of basketball. Politics was prominent in the US stories surrounding his retirement. Former US Ambassador to China James Sasser told the Washington Post, “Yao Ming gave the Chinese people and China a human face in the United States.” The Los Angeles Times noted “His exit from the foreign stage leaves a void in China’s international charm offensive with no obvious replacement” . The New York Times took the occasion to critique China’s “rigid, Soviet-inspired state network of athletic schools, coaches and bureaucrats”. A Houston writer accused China of “hiding the truth” that the injuries that forced Yao to retire at the exceptionally young age of 30 were caused by the nationalistic demands of “the same authoritarian sports machine that helped build him”. US observers have a knack for discovering geopolitical significance and hidden meaning in things that happen in China. I watched Yao’s retirement broadcast live on CCTV. Many Chinese commentators were sad and disappointed that Yao was retiring. Those who follow Chinese basketball expressed concern for the future of the league after its most successful product was no longer on the shelf. Yao himself did what you would expect every athlete to do at such a moment; he thanked the sport, the fans, his coaches, his teammates, his opponents, his hometown and life itself for giving him an extraordinary opportunity. It was a very moving but very ordinary sports moment. Yao also let everyone know, “Although I am leaving the court, I am not leaving basketball”. The former Houston big-man has a major financial stake in the Shanghai Sharks, the team he led to the CBA title in 2002 by finally defeating the Bayi Rockets, who won six straight CBA titles before falling to the Sharks. Yao plans to use his knowledge, experience and his interest in the Shanghai basketball club to improve the the quality of game in China. 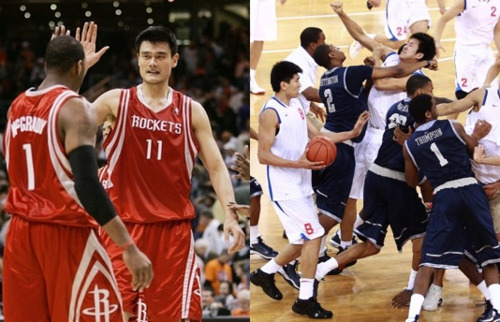 Yao, as well as anyone, knows Chinese professional basketball needs all the help it can get. Our second summer hoops story is a case in point. On 18 August Georgetown University basketball coach John Thompson III was forced to pull his players off the court at Beijing’s Olympic Stadium before finishing an exhibition game with Yao Ming’s old nemesis: the Bayi Rockets. The two teams had been fighting all night and in the third quarter the benches cleared, punches were landed, chairs were thrown and the fans pelted US players with full water bottles. Sadly, this is nothing new for Chinese basketball. Brawls are not uncommon in the CBA. Hometown refs who don’t have the skills to maintain control of the court are a big part of the problem. So are the coaches, whose habitual verbal and physical abuse of players is so odious that a group of younger Chinese players recently signed a “blood oath” protesting the practice. The fans are no bargain either. And if you’ve ever been the victim of a normal street crime in the PRC, as I have, you know how slow and spineless the local police can be. Protesters and dissenters can count on the full force of the well-trained Chinese armed police. Rowdy basketball fans get the rough equivalent of US rent-a-cops. Most US reports noted that the melee occurred during Vice President Biden’s state visit to China. Some mentioned comments by an anonymous State Department official who said, with a seemingly less concealed irony, that the visits are meant to “strengthen our people-to-people contact with China”. The trip was part of a State Department program conducted in cooperation with the NBA. Biden met with the team in China and attended the Hoyas game with the Shanxi Dragons the night before. The Weekly Standard’s Ellen Bork drew an analogy between Georgetown’s passion for sports diplomacy ending in a brawl on the court, and an overenthusiastic Vice President genuflecting to a hostile China. She described the Obama administration as trapped in a by-gone era of “ping-pong diplomacy” that has now been “replaced by an ongoing rivalry for influence in Asia and the world”. The Chicago Tribune suggested the Chinese refs and the Bayi coaches tolerated if not encouraged the violence. It also suggested the police intentionally stood by while American college students were being kicked, punched and abused by Chinese fans. The article quotes a Chinese blogger who speculates the violence may be connected to Bayi’s affiliation with the People’s Liberation Army (PLA). The US blog Information Dissemination claimed the fight was an intentional effort by the PLA to send a message to President Obama. It is worth quoting at some length, because it reflects the thinking of a core group of US China-watchers who believe the PLA has a virulent anti-American agenda and see signs of it everywhere. Who honestly believes it is simply a coincidence that the current US President loves basketball, that the current Vice President just happened to be in China, and that the referees were not being intentionally biased? Who honestly believes the PLA soldiers weren’t told to get out there and be aggressive with the Americans? This type of hyperbolic conjecture about Chinese intentions towards the United States is unfortunately very common, including in U.S. military and Congressional “analysis”. It is true that the Bayi players are soldiers. They’re obligated to enlist when they sign with the team. But all they do is play basketball, and basketball—sport—is the interesting story here. One of the reasons Bayi dominated basketball in China is because it was the only team that could recruit nationwide. The old socialist-era Chinese internal household registration system forced other clubs to confine recruitment to their hometowns. Times, and the old socialist character of Chinese society, are changing. Money, markets and a freer flow of labor have eroded Bayi’s recruiting advantage, although the team retains appeal because the PLA benefit package provides a solid safety net for post-career players. But their dominance has clearly faded. Bayi only won two titles in the last nine years. The new powerhouse in the CBA is the Guangdong Tigers, who won the other seven. A pair of Chinese scholars argue that Guangdong’s success is a product of the region’s increased private investment in the sport. This is reflected in the emergence of multiple local basketball clubs, increased competition, better training facilities, better coaches, and a better environment for players. Guangdong’s rise is not only changing the character of the CBA, but the Chinese national team as well, which features an increasing number of Guangdong players. If Yao Ming is able to encourage similar successes in Shanghai, perhaps with the help of other Chinese players who have some experience in the NBA, Chinese professional basketball may have a brighter future. If it does, maybe US commentators will be more interested in the sport itself, and how it is faring in China, than in finding geopolitical messages in basketball stories. Chinese officials often complain that the United States is stuck in an old Cold-War mentality that prevents Americans from understanding what is happening in China today. After looking at the way the US media reacted to these two stories, it is not hard to understand their complaints. China in Focus is an occasional series by Gregory Kulacki.